The Old Forge Seafood Restaurant01328 878345work Restaurant with RoomsAwarded 2 AA Rosettes April 2011 and April 2012 for culinary excellence, The Old Forge is situated in a prime position for Holt, Walsingham, Holkham Beach, Wells-Next-the-Sea and Blakeney. It is in Thursford, the village renowned for its Christmas Spectacular. Trip Advisor 2012 Certificate of Excellence. Achieved "Excellent" 5 star rating from Environmental Health, North Norfolk District Council. The restaurant is open all year and opens early at 4.00 pm especially for the Christmas show to cater for the matinee and evening performances. Pre-theatre meals are offered for the show plus additional specials and our full à la carte. The Old Forge has been featured twice on BBC national television breakfast news showing the chef/proprietor cooking various seafood dishes and more recently on a Channel 4 cutting edge documentary. 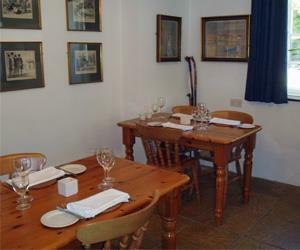 Awarded 2 AA Rosettes April 2011 and April 2012 for culinary excellence, The Old Forge is situated in a prime position for Holt, Walsingham, Holkham Beach, Wells-Next-the-Sea and Blakeney. It is in Thursford, the village renowned for its Christmas Spectacular. Awarded 4 star AA accommodation rating April 2012. Full English breakfast included using all local ingredients. ALL ROOMS ARE EN SUITE. Cycle storage available. Children welcome. Dogs welcome. Based on A148 main Fakenham to Holt Road at Thursford.